You know how you get all excited about a purchase and then when you get it you are just overwhelmed with disappointment. This is the feeling I am sure plagues the plus size shopper, since we are very much limited to online shopping. 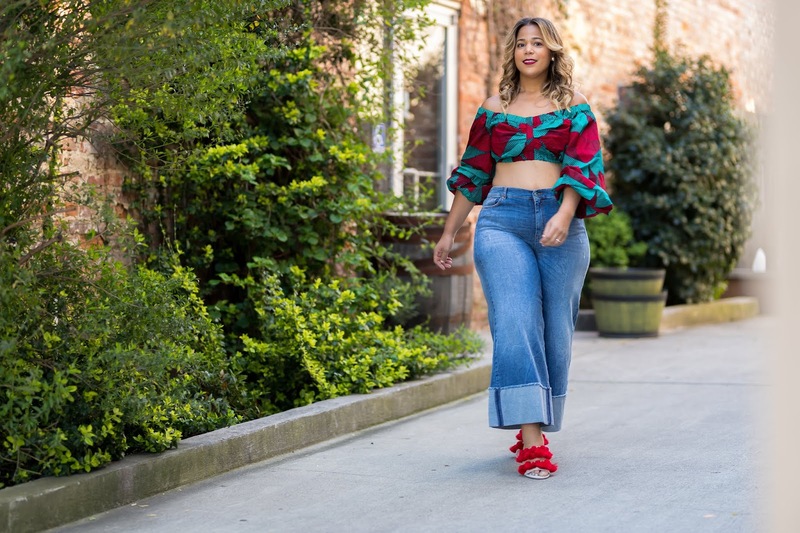 Now I will say that until the last two months my shopping with eShakti has been good. But starting around September everything has went downhill. It started with my purchasing of my bridesmaid dresses from them. Let's just say the color I ordered that was pictured on the site and the color that was sent was just two different things. After back and forth emails and just overall frustration I abandoned ship. I will just choose another company to deal with for the bridesmaid dress. Just because a company may have gotten one thing wrong with an order doesn't automatically mean that I don't order anymore. I usually give retailers the benefit of the doubt because who doesn't make mistakes. That's just life. 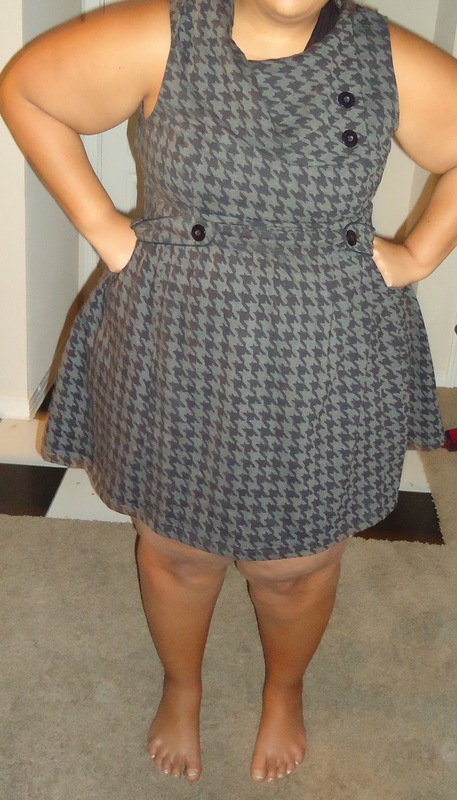 I purchased this Houndstooth Print Fleece Dress from eShakti a couple weeks ago. Now if anyone knows anything about eShakti, the products come from India and is about a 2 week wait before you receive your garment. They don't allow you to do even exchanges. Shipping is $8.95. Now when you are doing a return with them I generally spend another $10 for returns then if I decide to reorder the item (the reason to reorder is that I can custom the order to ensure the length) that is another $8.95 for shipping. Let's calculate. That's $27.90 in shipping along for an order correction. See my frustration. So it is imperative that you get your order right the first time. Now I must say that I think I have some expert skill in online ordering. I know my body really well and I can generally tell how things will fit, the expected length, etc. So take a look at the dress above. It looks like a dress for the office and other conservative type environments. My assumption is this dress will be conservative in length. The dress will probably just cover the knee or fall right at the knee. So my question to eShakti is where the heck is the rest of my dress!!! I hate taking unflattering pictures of myself, but it had to be done. This picture was taken this morning before I got ready for work. I know I look pretty rough and my knees look ashy --- I think it must be dry in Texas or something because I have issues with dry skin here. Anyways, this photo actually makes this dress look longer than it is. It comes to about mid thigh and barely (and I mean barely) covers my back area. Like, "COME ON!" Should I really be this off on the length. I honestly don't think so, but maybe I'm wrong. Tell me what you think. And on top of everything else, my dress smelled like it had been sitting on top of an exhaust pipe with someone hosing it down with gasoline. It reaked so bad that I put it on my balcony so it wouldn't stink up my apartment. This is definitely a first for me and I have done a lot of online ordering. Let's just say I am extremely frustrated and the dress will be going back. 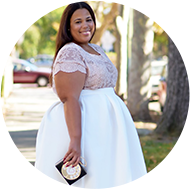 Sorry to hear about your dress :( If your set on houndstooth though, try out this one from Lane Bryant - I just bought it and it's PERFECTION! I will say that I ordered a dress from them about a week and a half ago and right now I'm not to happy with the way that this is going... I put in my own measurements but I mean COME ON... Does it really take this long to get a dress?? Ok so now you and Ariana got me lusting after this website. When you ordered the dress did you put in custom measurements and request it to be longer? I'm guessing you did. I want to order something but don't want to spend the xtra money on shipping and returns. Aside from the length and smell (sorry) it looks cute. Shaniqua-can you post if you are happy with your dress when you get it. What a bummer. I had the same issue with the one and only dress I ordered from them. I put in custom lenght to be below the knees and when it arrived it reached at least three inches above the knee! I love what I see on the website, however I'm not sure I want to go through the hassle of ordering again. So disappointing! I love the idea of this website, but now I'm scared to even try it.